My last trip to a ‘medical’ spa involved having 1,000 injections of my own blood pumped in to my fearful face. Yes, in my experience, as soon as the word ‘medical’ is floating around, it’s no longer martini manicures and preened pieds – it’s hard graft! 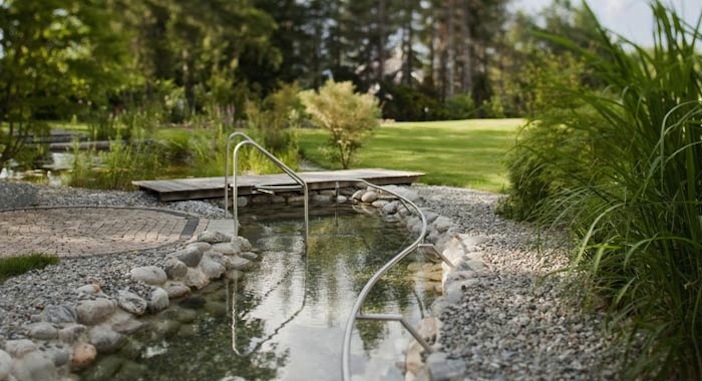 The hottest medical spa right now is the award-winning Parkhotel Igls. Located in a picturesque Austrian hillside village teetering above the Tyrolean capital of Innsbruck, this convenient retreat is under two hours flight from London and was recently crowned ‘Best Spa for Medical Marvels’ by Tatler and ‘Best Destination Spa’ by Conde Nast readers. A pioneer of modern Mayr cuisine, this well-established hotel boasts a world-class spa and an incredible medical centre which is home to an A-team of health and fitness professionals waiting to transform you – and all under the watchful eye of the stunning snow-capped Alps. Ideally guests would spend two to three weeks at Parkhotel, but thankfully from June – September they are offering guests a great value four day programme to kick start their detox. As an avid spa trekker I immediately booked in to test it out– but on this occasion it wasn’t vampire facials that worried me… it was starvation! Created by the Austrian scientist and physician Dr F. X. Mayr, the diet stems from the belief that almost all illnesses can be traced back to inadequate digestion or lack of exercise. 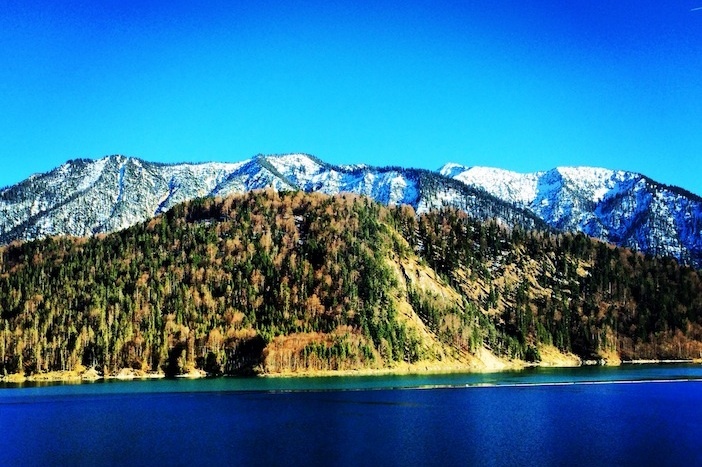 &amp;amp;lt;img class=”alignright size-full wp-image-38067″ src=”http://www.arbuturian.com/wp-content/uploads/2014/04/Parkhotel-Igls-food.jpg” alt=”Parkhotel Igls food” width=”315″ height=”527″ /&amp;amp;gt;Parkhotel Igls’s holistic approach is refreshingly bespoke, with expert doctors building each guest’s diet, treatments and exercise programme around their medical history and goals. 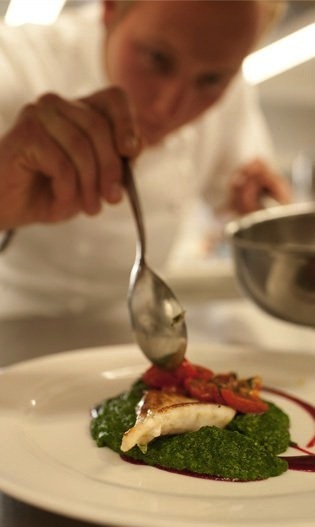 The hotel operates 8 strict diet levels, varying from fasting on herbal tea and the odd cracker, right up to the Mayr Vital Diet which offers a hearty breakfast, a healthy four course lunch and light supper. Having arrived to a beautiful crimson sunset melting in to the mountains we hit the sack, ready for a night of chocolate filled dreams before the morning’s dreaded diet verdict. Admittedly I’m a little on the curvy side, but I find it easy enough to drop the pounds – I lost 200 just getting through departures (damn Duty Free). No, our visit wasn’t for weight loss, it was for de-stressing and de-toxing – we had to be on Mayr Vital, didn’t we? The next morning Sam and I awoke to the sun streaming through the windows. Having nervously wandered along our private balcony taking in the fresh Alpine air whilst sipping our daily ‘bitter water’ (laxative! ), we made our way down to breakfast where a parade of dirndl-clad waitresses awaited. “Here’s your breakfast. Chew each bite twenty times before swallowing and your saliva will turn it sweet. Enjoy”, she said as she floated away leaving Sam and I staring fearfully at the dry spelt roll in disbelief. Oh boy, we had to be on the top diet. An hour later, Sam emerged from the doctor’s room beaming having clinched the Mayr Vital diet. Having practised my malnourished face and suitably sucked in my stomach I entered the doctor’s room. A pristine white-clad doctor with a mane of silver hair gracing his perfectly tanned face welcomed me looking like the epitome of health. Having gone through my chequered medical history he weighed me, ‘perfect’ he said reassuringly. Then he measured my waist ‘perfect again’, he repeated. Feeling rather smug I lay on the bed as he examined my stomach, seconds later I jilted in pain. ‘You have a spastic colon,’ he diagnosed. Slightly disappointing in anyone’s books, but the diagnosis paled in to insignificance when I too clinched the Mayr Vital diet before finally exhaling back in to my snug size 10 leggings. “Hmmm….”, said Peter, “You’re wonky, but only when you’re standing up”. I looked at him apologetically and mildly amused as he began stretching and twisting me. “Aha… maybe you have one leg longer than the other!” he debated. Wow – a spastic colon and miss-matched legs, day one was full of surprises. By now our caffeine and sugar-free detox was taking hold and greeting us with uncontrollable headaches and exhaustion, so we were relieved to see an afternoon of pampering ahead. 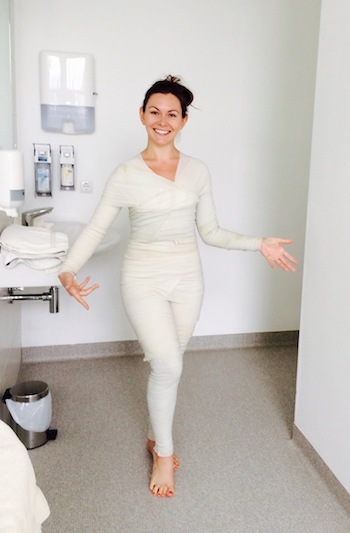 As an avid spa trekker I’ve experiences some pretty unusual treatments, from getting totally gold-plated in the Tuscan hills to fish pedicures in seedy Soho, but whilst Sam’s therapist was exfoliating him in to a silky skinned Adonis I was facing one of my strangest treatments yet; the terra-vit wrap. Having been slathered head to toe in a mysterious mixture of algae, salts and clay, my entire body was wrapped in mineral-enriched bandages before lying on a bed and being cocooned in layers of cling film, towels and sheets. This treatment is said to stimulate the lymphatic drainage so with dreams of a size six body awaiting I drifted off. Shortly before my hour was up I awoke, boiling and eager for air, but bound by the layers. 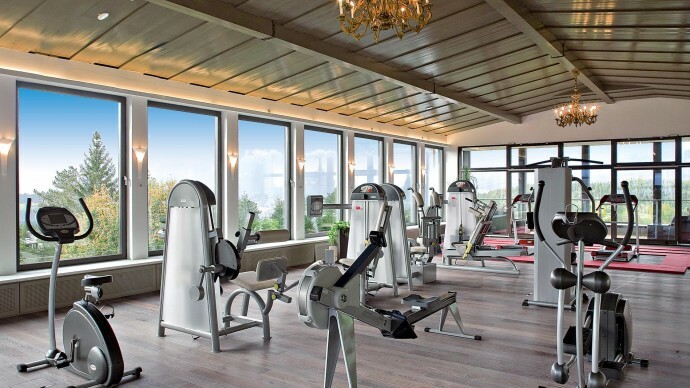 &amp;amp;lt;img class=”alignright size-full wp-image-38057″ src=”http://www.arbuturian.com/wp-content/uploads/2014/04/Parkhotel-Igls-terra-vit-wrap.jpg” alt=”Parkhotel Igls terra-vit wrap” width=”350″ height=”533″ /&amp;amp;gt;Having rocked about in the clinical room like an asylum patient trying to break free and had my expert German skills fail to uncover my therapist (“hallo…!?) I crept out and found her. Having returned me to my room she unwrapped me to reveal silky cellulite free hips. Wow – I wondered if I was hallucinating (as did the guests that thought they saw an Eqyptian mummy roaming the grounds) – this place really did work medical marvels. In fact, it also worked miracles… the following day I awoke to find Sam, famous for his 5am alarms (yes, even on a Sunday) fast asleep and demanding a lay in. You see, there is no denying that the first two days of detox were a struggle. From our stomachs getting used to the new diet (not to mention the laxatives) to the caffeine and sugar withdrawal giving us constant migraines and sucking away all of our energy. In a bid to wake up we tried the morning kneipp circuits; a ritual alternating between hot and cold waters to strengthen blood vessels and fight headaches and fatigue. Luckily, they were also a procession of pampering, with the most demanding decisions being us debating the sauna or steam room and our only meetings being with some of the best therapists in the world. Our days were filled with expert massages, relaxing heat packs and the odd swim. Then… on day three, the cloud lifted. We awoke, headache free, bright-eyed and full of life. After our morning polenta porridge and malt coffee we were raring to go and after another morning of blissful pampering we signed ourselves up for a spot of Nordic walking – just one of the many activities on offer. Despite having woken to an arctic-style snow storm, by midday the surrounding area looked like a Ricola advert once again; all fluro meadows against Disney-blue skies. For guests who do have energy, Parkhotel Igls makes a great base, with bikes to borrow and a bevy of nearby Alpine villages to discover. Still full of energy we cycled to Innsbruck (I use this term lightly as it is a vertical drop down and we cheated a got a bus back – come on, all newfound energy is limited folks! ), where we discovered the fairytale old town with a scarily fragrant market which we proudly denied and a labyrinth of cobbled, colourful streets leading to the river. After a blissful night’s sleep we awoke on our last day and headed down to breakfast where Sam eagerly ordered spelt porridge and malt coffee with soy. I couldn’t help but stifle a giggle, normally he was revolted by my decaf extra hot soy flat white lark but he had truly embraced this week. And, despite our bumpy introduction to the Mayr way, we really had seen results. Our eyes were beaming white at last, we no longer needed our caffeine kicks and we had lost weight (well, Sam had). As I turned to check my itinerary I heard some German banter, only to look up and see he had somehow mastered German overnight too – another Parkhotel miracle indeed. As we took in the picturesque views for the last time and said our goodbyes, Sam turned to me whilst pointing out the hotel’s al fresco Kneipp pool, “You know, we could turn the duck pond in to a kneipp circuit”. I looked at him dumfounded, waiting for him to laugh. “What, we’d just need diving shoes”. Wow, we’d been Mayr’d. Health Retreat Parkhotel Igls, pioneer of Modern Mayr Medicine, offers rooms from €143 pppn; treatment programmes are in addition. The Short Stay Summer Programme (4 days) is priced from €745 and the Basic Programme (7 days) is priced from €850. For Modern Mayr Medicine to have a beneficial effect a minimum stay of one week is recommended.